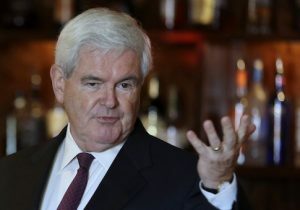 A new political action committee is hoping to convince former Speaker of the House and presidential candidate Newt Gingrich to run for the U.S. Senate in Virginia next year. Draft Newt PAC insists Gingrich, now a host of CNN’s Crossfire, is Republicans’ best hope for retaking the Senate seat currently held by Sen. Mark Warner (D., Va.), who is vying for his second term. "We want a credible challenger to Mark Warner, and no one could do what Newt could do to fight—and win," said Andrew Hemingway, a former staffer on Gingrich’s 2012 presidential campaign who is leading the Draft Newt group, in a press release announcing the effort. "U.S. Senator Newt Gingrich would be an immediate game changer, giving conservatives another voice that would take the fight to the Obama administration," added Hemingway, who ran fundraising for the 2012 presidential bid. Gingrich represented Georgia’s sixth congressional district in the U.S. House, but has lived in McLean, Va., since 2009. Efforts to reach him or a member of his staff were unsuccessful. Gingrich was at the center of a controversy in Virginia during his presidential run, when he failed to collect the necessary signatures to gain a spot on the state’s primary ballot. Attorneys for his campaign challenged the decision, but eventually dropped the effort. Gingrich suspended his presidential campaign three months later and eventually withdrew from the race. Warner, elected in 2008, has put up strong polling numbers against potential Republican challengers. Two Republicans, state GOP official Howie Lind and insurance professional Shak Hill, have so far declared their candidacies. No polling firm has so far stacked them up against Warner. Geoff Skelley, a political analyst at the University of Virginia’s Center for Politics, is skeptical that Gingrich could unseat Warner, who Skelley said would be very hard to beat. The Center for Politics rates Warner’s senate seat as a "safe" Democratic hold. Though Gingrich has been a Virginia resident for more than a decade, Skelley explained, he could be susceptible to attacks that have dogged current gubernatorial candidate Terry McAuliffe (D.). "Terry McAuliffe has gotten a lot of ‘you’re not really a Virginian’ even though he’s lived here for over two decades," Skelley said. "Gingrich would be more vulnerable to such attacks." However, Skelley predicted he would fare well in a primary. "Gingrich would obviously have far more name recognition and fundraising ability" than Lind or Hill, he said. 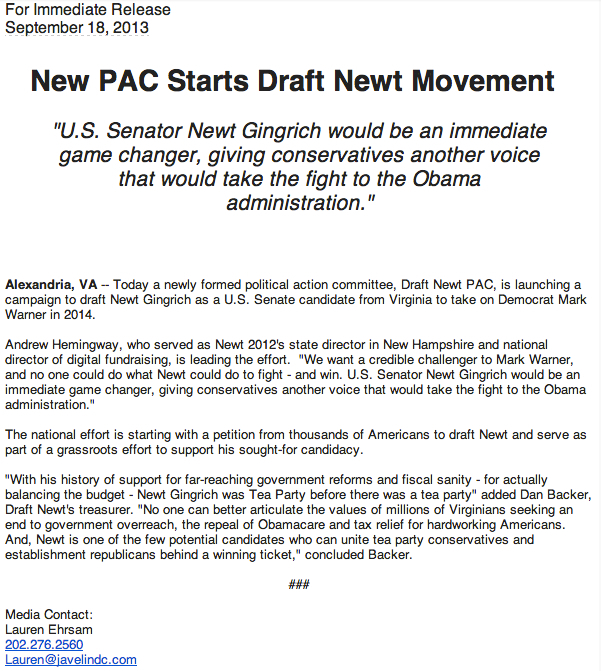 Gingrich’s wide appeal among Republicans is a major selling point for the Draft Newt effort. "Newt is one of the few potential candidates who can unite tea party conservatives and establishment Republicans behind a winning ticket," Dan Backer, Draft Newt’s treasurer, said in the group’s news release. Skepticism of Newt’s chances against Warner is due primarily to a "lack of understanding of the motivation of the grassroots base," Backer said in an email. All the speculation is moot if Gingrich opts to stay at CNN. "I’m sure he’s doing very well as a panelist on Crossfire," Skelley said.